…a general purpose raconteur for all media. He has been writing professionally since he was 15 years old, when he was hired by his hometown daily newspaper to write advance obituaries. From that august beginning, he began a run as a broadcast journalist on a variety of public and commercial radio stations which, somehow, led him into a career as a marketing and public relations guru specializing in audience development. As a young unemployed person, having nothing else better to do, he wrote a play. He sent that play to a friend who in turn sent it to a new play festival, which it won, resulting in his first production. He has written a long string of comedies, a handful of dramas, one-and-a-half musicals, and has co-written a piece for young audiences that toured auditoriums, cafetoriums, gymnatoriums, and a couple of actual theatres for more than four years. He has a soft spot for smart young people who want to change the world through art and/or technology, a penchant for old cars, good coffee, fine wine, diner food, the works of William Shakespeare, soap operas, the Baltimore Orioles and beagles, and believes passionately in increasing LGBT visibility across the spectrum. He lives happily with his husband in Central New York where it snows a lot and only lies about his age and his height. 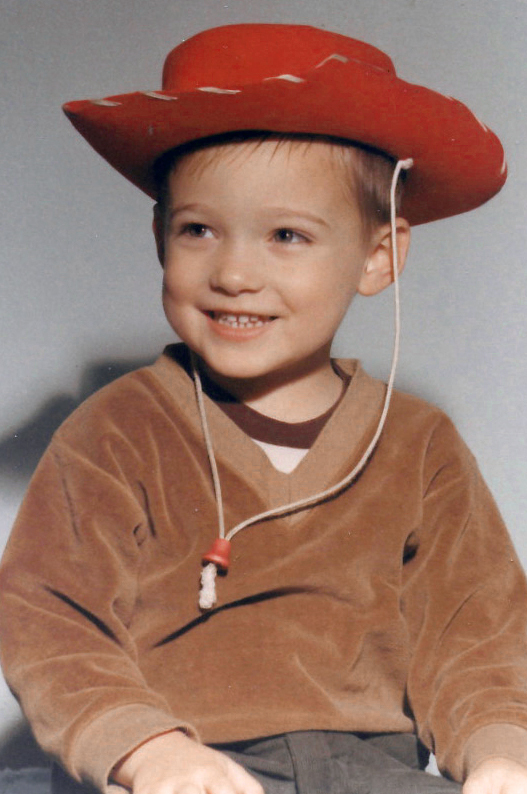 As the accompanying photo shows, he began life as an adorable cowboy.